Two chickens were lying side by side in the refrigerator case of a Moscow shop in the Soviet year of 1988. One, American, was plump and cheerful; the other, Russian, was scrawny and sarcastic. “I’m so much fitter than you,” said the American to the Russian. “Well, at least I died of natural causes,” replied the Russian. Not funny any more, and no more jokes like that. Today, if the American chicken is to be allowed into the Moscow shop, he will be obliged to pass a medical test which the local poultry has already passed with flying colours. Pigs, too. Russian bans on imports of US pork and poultry, the principal line of trade between the two countries at present, will be lifted as US government officials have now agreed to accept Russian standards for lowering or eliminating antibiotic and chlorine residues in meat packaged and shipped to Russia. Negotiations to lift the import ban on poultry with chlorine residues are also close to completion, according to an announcement by US Agriculture Secretary, Tom Vilsack. The Russian Trade and Inspection Agency (Rospotrebnadzor) had initiated new chlorine limits for poultry processing, commencing in January. The new limit is 0.3 to 0.5 milligrams of chlorine per litre, which is also the potable water standard. The same regulation exists for the European Union (EU) produced poultry, so imports from the EU have not been damaged, an RPN source told Fairplay. 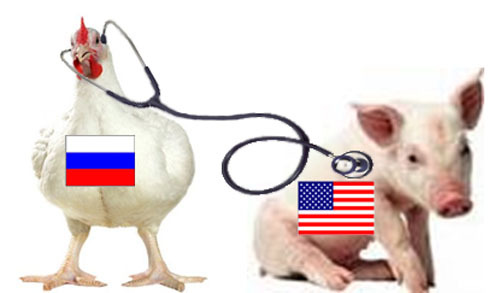 Russia bought 131,342 tonnes of US pork last year, down 33% percent from 2008, according to the USDA. Before the chlorine limit halted US chicken imports, lobbying by Russian poultry produces had led the Russian Agriculture Ministry to announce a government order cutting the 2010 quota for imported poultry by 18% to 780,00 tonnes. US chicken imports were fixed at a new quota of 600,000t, down 20% on last year. Until this year, one chicken in five on sale in the Russian market came from the US.